Two reformist members of the Iranian Parliament have called for putting major domestic and foreign policy issues to a public vote. 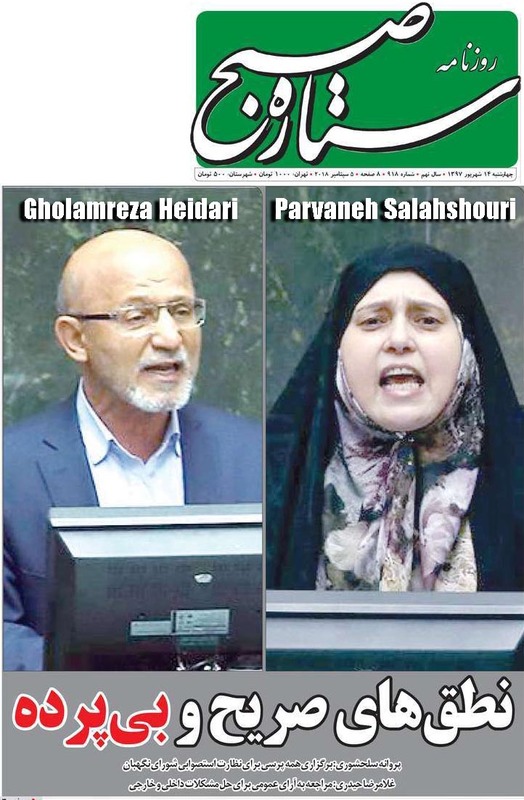 In their speeches on September 4, Parvaneh Salahshouri and Gholamreza Heidari called for a referendum to solve problems regarding foreign policy, state TV, the Guardian Council's intervention in elections, and the Assembly of Experts' supervision of the supreme leader's behavior. Salahsouri called on "military institutions to return to their garrisons" and demanded support for the underprivileged, putting an end to the house arrest of opposition leaders, releasing political prisoners from jail, and a declaration of amnesty for Iranians living abroad so that they can return home. She also called on the government to put an end to state TV's monopoly by allowing the private sector to operate networks. These are the major issues that have caused political deadlock, and all of them are linked to Supreme Leader Ayatollah Ali Khamenei in one way or another. Iran's most significant foreign policy issue has remained unsolved as the leader has publicly forbidden negotiations with the United States about Tehran's nuclear program, missile program, or its intervention in the affairs of regional states. ​Meanwhile, state TV, which is under Khamenei's supervision, has lost the nation's confidence in the government's information dissemination because of its biased and unilateral news coverage. At the same time, critics inside and outside the government have been criticizing the Guardian Council's vetting of election candidates and the Assembly of Experts' failure in supervising Khamenei's behavior and the organizations linked to his office. The two MPs strongly criticized the performance of the institutions operating under Khamenei's supervision. Salahshouri also lambasted President Hassan Rouhani for saying Iran was not experiencing a crisis. "Everyone knows that we are dealing with super-challenges," she said. Salahshouri added, "There is no trace of democracy left in Iran as a result of shutting up the critics, and corruption and unfair trials prevented the formation of the Islamic utopia we were hoping to restore." she also criticized the IRGC for its lion's share of "power, wealth, and military force," adding that state TV, the Guardian Council, and the Assembly of Experts have harmed the nature of Iran's political system as a republic. Salahshouri called on Khamenei to save the country by calling for a referendum to solve these problems. Previous calls to change the constitutional law were frowned on by hard-liners close to Khamenei, even when they were made by Rouhani, who was accused of supporting a secular democracy after demanding a change in the constitution by holding a referendum. Some 40 hard-line MPs called for disciplinary measures against Salahshouri and Heidari. Salahshouri tweeted that some conservative MPs have used "radical language" to caution her. Heidari in his speech criticized Iran's "costly" nuclear and missile programs and said the seizure of the U.S. Embassy in Tehran in 1979 led to international sanctions and eight years of war with Iraq. In a related development, the surfacing of a 2006 interview published by the Assembly of Experts shed light on Khamenei's strong opposition to the assembly's inspection of organizations and institutions under his supervision. In the interview, Ayatollah Ali Jannati, the current head of the assembly, who is also the Guardian Council's secretary, quoted Khamenei as having said that the assembly's supervision of the armed forces is "out of the question." Meanwhile, according to Jannati, while a majority of assembly members wanted to inspect the organizations under his supervision, Khamenei opposed their views and they failed to seek his approval even after several meetings.